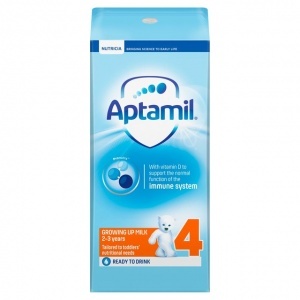 Aptamil Growing Up milk 2-3 years is nutritionally tailored to your toddler's stage of development. Suitable from 2-3 years, it contains Pronutra+, our unique blend of ingredients. Ideal for use when you're out and about. Easy to pour and resealable. Can be stored in the fridge for up to 72 hours after opening. Water,Skimmed Milk,Lactose (from Milk),Galacto-Oligosaccharides (GOS) (from Milk),Vegetable Oils,Fructo-Oligosacchrarides (FOS),Acidity Regulator (Citric Acid),Emulsifier (Mono- and Diglycerides of Fatty Acids),Fish Oil,Magnesium Hydrogen Phosphate,Vitamin C,Calcium Hydroxide,Calcium Citrate,Potassium Citrate,Milk Flavouring,Potassium Hydroxide,Calcium Phosphate,Ferrous Lactate,Taurine,Vitamin E,Vitamin A,Vitamin D3,Pantothenic Acid,Copper Gluconate,Nicotinamide,Sodium Selenite,Zinc Sulphate,Biotin,Folic Acid,Potassium Iodide,Vitamin B12,Thiamin,Vitamin B6,Vitamin K1,Riboflavin,Manganese,Sulphate. Typical values per 100ml prepared feed: Energy :: 210 kJ 50 kcal, Fat :: 1.9g, of which, saturates :: 0.3g, of which, unsaturates :: 1.6g, of which, LCPs? :: 14.9mg, - Arachidonic, acid (AA):: 0.6mg, - Docosahexaenoic,acid (DHA):: 8mg, Carbohydrate :: 6.3g, of which, sugars :: 6.2g, of which, lactose :: 5.8g, Protein :: 1.5g, Fibre :: 0.8g, Salt :: 0.06g, Vitamins: , Vitamin A :: 65?g-RE, Vitamin D3 :: 1.7?g, Vitamin E :: 1.1mg ?-TE, Vitamin K1 :: 5?g, Vitamin C :: 14mg, Thiamin (B1) :: 70?g, Riboflavin (B2) :: 90?g, Niacin (B3) :: 490?g, Pantothenic acid :: 570?g, Vitamin B6 :: 60?g, Folic Acid :: 18?g, Vitamin B12 :: 0.13?g, Biotin :: 1.7?g, Minerals: , Potassium :: 85mg, Chloride :: 43mg, Calcium :: 85mg, Phosphorus :: 54mg, Magnesium :: 10mg, Iron :: 1.2mg, Zinc :: 0.9mg, Fluoride :: <3?g, Iodine :: 18?g, ?Long Chain Polyunsaturated fatty acids. 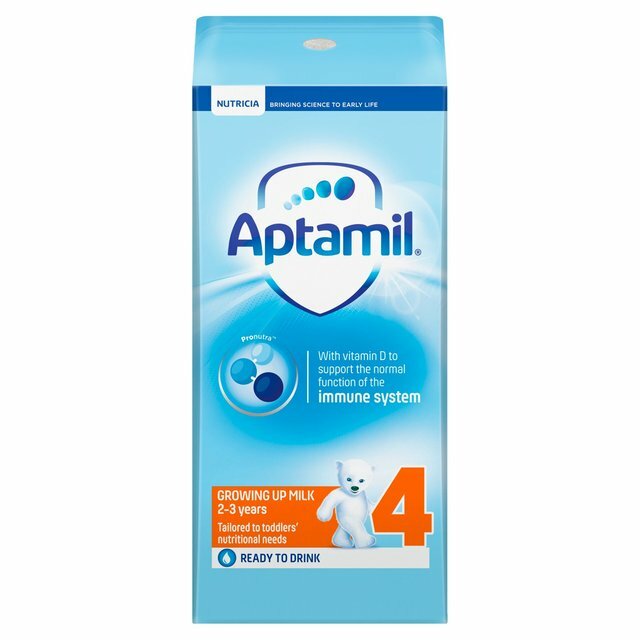 Feeding guide Your toddler will require about 2 x 150ml beakers of Aptamil Growing Up milk a day, as part of a balanced diet. Aptamil Growing Up milk is specially formulated to help meet the increased nutritional needs of toddlers from 2 years onwards. Preparing your toddler's drink 1. Shake well before use. Using straw, pierce top of carton. 2. Serve at room temperature or cold. 3. Toddlers should be supervised at all times when eating and drinking. Important feeding instructions Do not allow prolonged or frequent contact of drinks with your toddler's teeth as this increases the risk of tooth decay. Ask your health professional or dentist for advice.